I never was a huge fan of Valentine’s Day! I never thought it was that romantic to get flowers and candy on the same day that millions of other women do! I always tell my husband that our anniversary means so much more to me, so don’t buy me expensive things on Valentine’s Day! I have grown to like Valentine’s Day more over the years. I don’t know if I am just getting older or sappier? We do like any excuse to have a party and to celebrate in this house. Over and over God tells us to “love one another” so why not celebrate the LOVE all around us! Everyone in our lives could use a little more love! I don’t think of it being just a day of romance. We have a LOVE Day! We have fun celebrating in our house…. I started off by writing the valentine’s notes the night before and getting the decorations on the table. (I don’t spend much money on this at all!!! I save party decorations and supplies from years before and use those. I just put what I have together and try to make it work. It’s good enough for them! 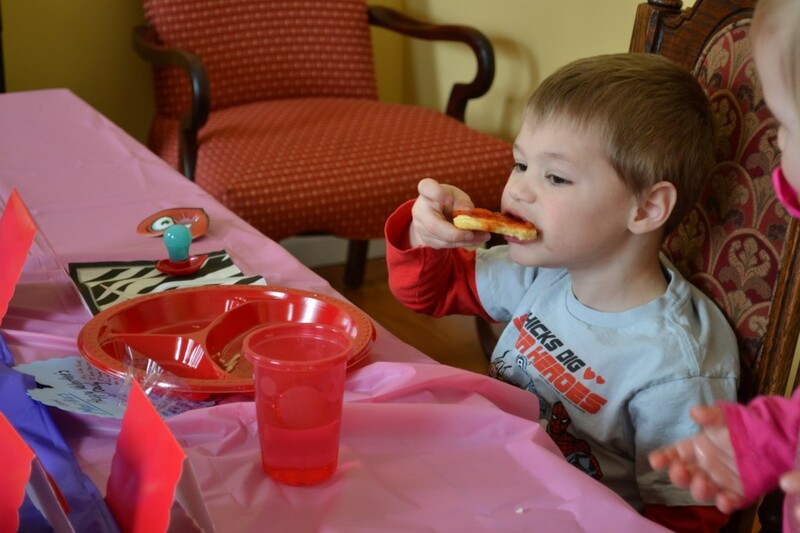 The craft was made out of paper and toilet paper rolls (we can collect those pretty easy 🙂 ) The lunch was little heart pizzas and heart cookies. We did get the kids Despicable Me 2 DVD. They have been wanting it since Christmas. So we were able to enjoy the movie together in the afternoon. We made daddy a hand made card with all the reasons why we love him. Made cupcakes for dessert. I made a dinner at home that I knew the dad of the house would love, loaded chicken nachos. Then, after dinner we played the games that I made and brought to school. So, those were reused. A day full of fun and I used most things we already had! 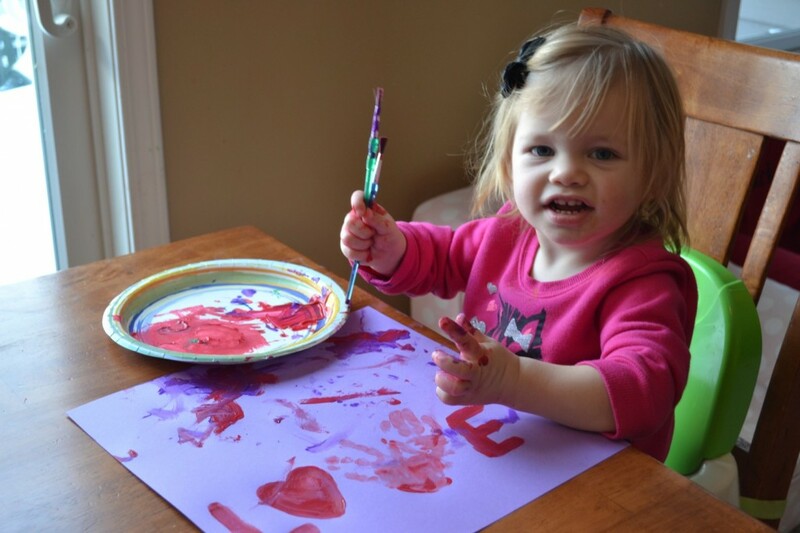 The baby of the house painting some pretty LOVE decorations! 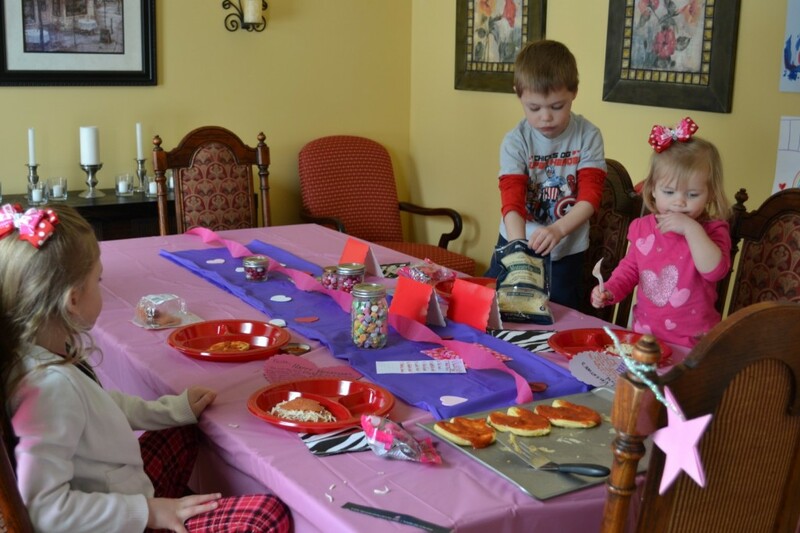 Of course I had school Valentine’s parties to attend. 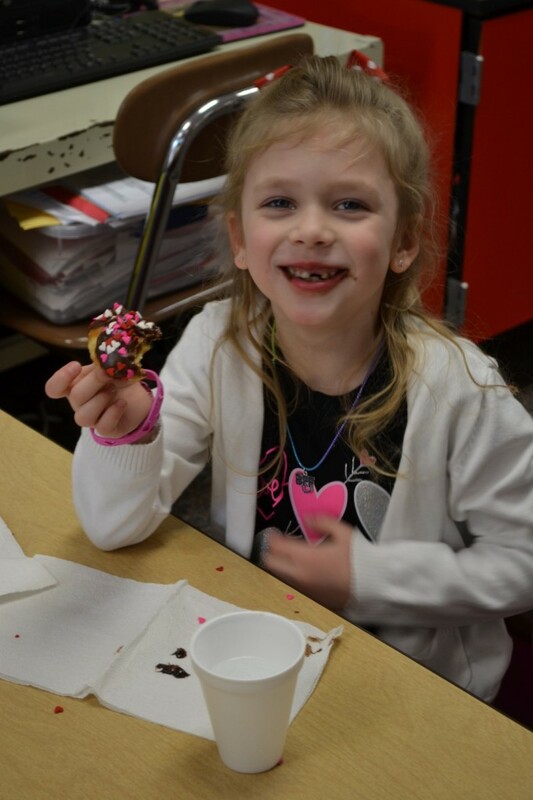 We did some fun crafts and games with the kindergartners! 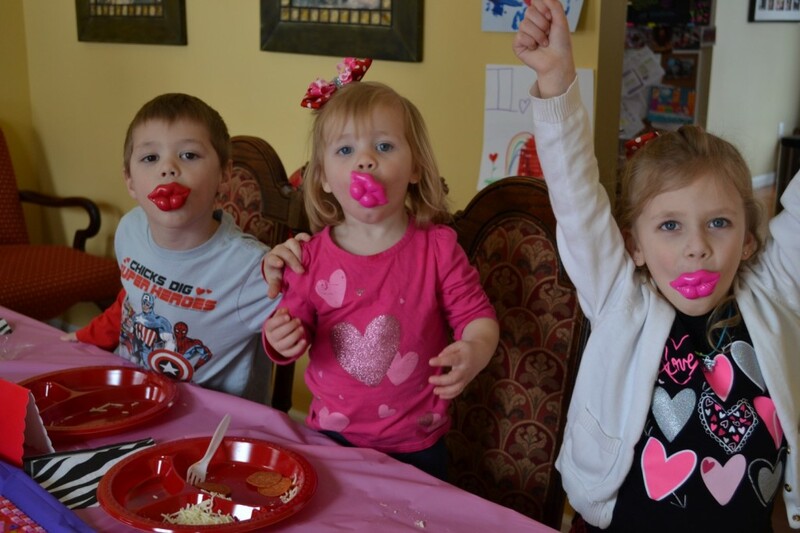 We had our at home lunch party (the 2 older kids go to school half days. It gives us more time to have fun in the afternoon!) Here the kids are working on their heart shaped pizzas. 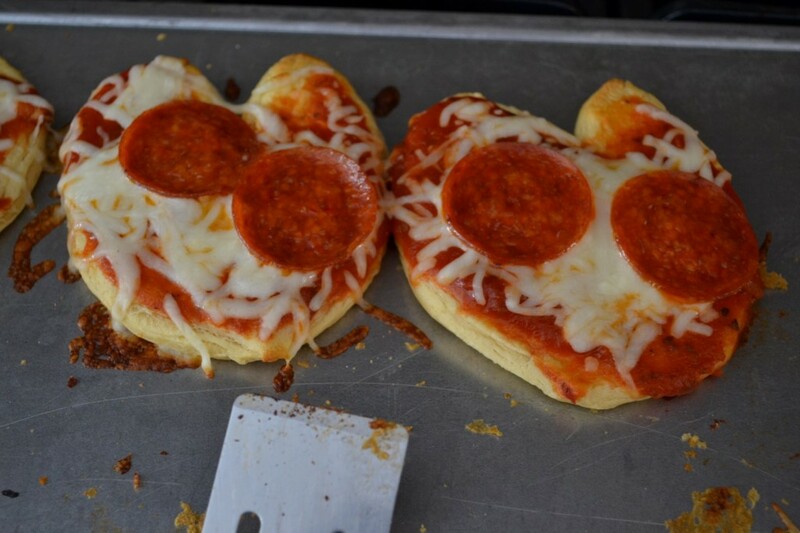 I made the heart pizza crusts while they were at school. to make this go faster, since I knew they would be hungry! I like how in this picture it says “I love you” on the wall right by her head! 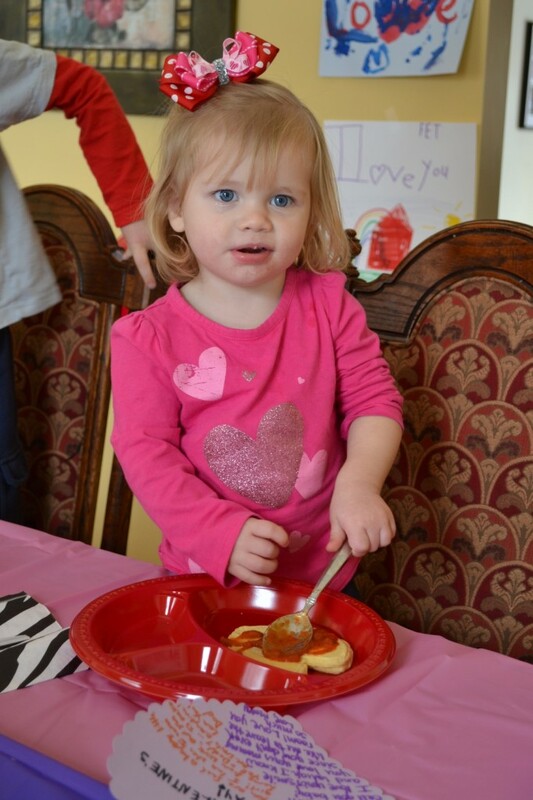 We definitely had a house full of LOVE this Valentine’s Day! 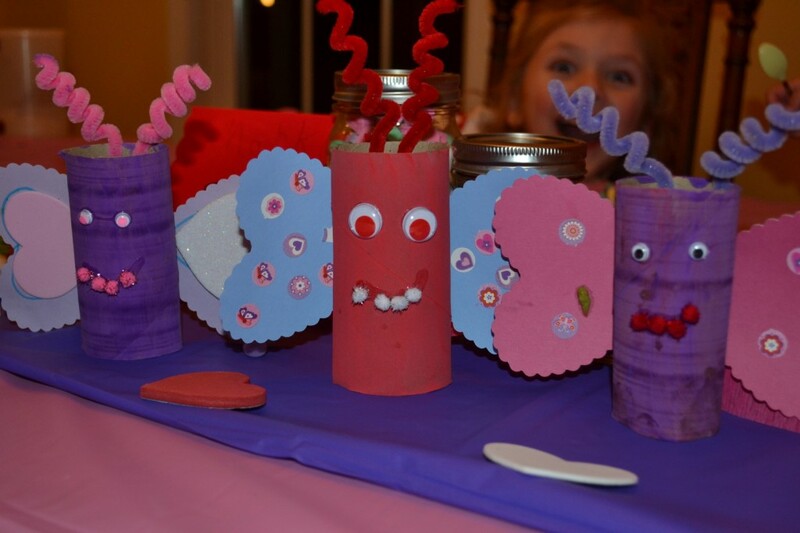 This entry was posted in Family traditions, Projects by Candiss Terborg. Bookmark the permalink.